THE SIKH NUGGET: Should the last Sikh maharajah be returned to India? Should the last Sikh maharajah be returned to India? A Sikh charity is planning to exhume the body of a prince, the last ruler of a Sikh empire, from his grave in the English countryside and send it back to the Indian state of Punjab. But how did he come to end up in exile? This is the extraordinary story of Maharajah Duleep Singh, a boy prince who was born in Lahore in 1838 to a very powerful ruler.His father Ranjit Singh died the following year, which led to unrest in Punjab.At the age of five the boy prince sat on the throne of the Sikh kingdom, although his mother and uncle conducted the state's affairs in reality. More unrest followed and by the time the second Anglo-Sikh war broke out in 1845 the British had the perfect opportunity to step in.In 1849, Punjab was annexed to British India and Maharajah Duleep Singh was removed from the throne. 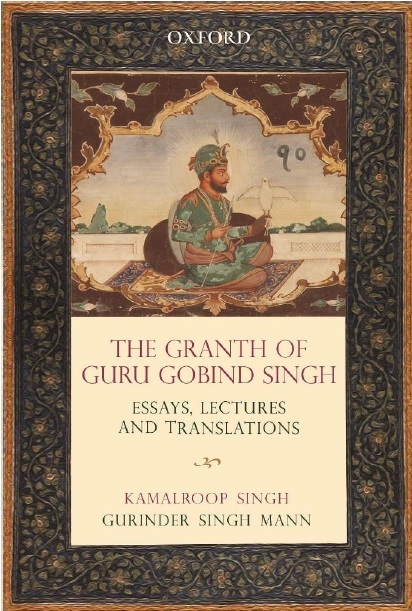 He was to be the last ruler of the Sikh kingdom. The young maharajah was separated from his mother Maharani Jind Kaur, who was imprisoned, and he was taken away from his home in Lahore to Fatehgarh, in what is now the Indian state of Uttar Pradesh. This had become an establishment for the wives and children of the British officers - almost like a British settlement within India. Duleep Singh was placed under the guardianship of army surgeon John Spencer Logan and his wife Lady Logan, and was given a bible. "He was taught a very English way of life - his language, culture, religion were cut off from him and he became a ward of the British. And here he could be moulded to how the British wanted him to be," says historian Peter Bance. 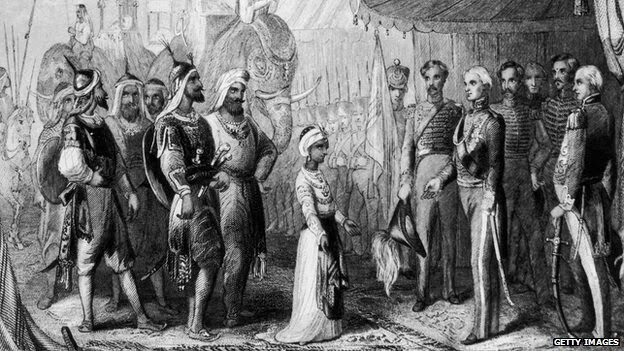 Eventually, the young maharajah converted to Christianity.In May 1854, he arrived in England and was introduced to Queen Victoria who took an immediate liking to him. "He was that exotic prince and she treated him like a favourite son and he would be invited to every royal gathering. He even holidayed with Prince Albert and Queen Victoria. He became the ideal party piece that every lord and lady wanted at their event," Mr Bance says. 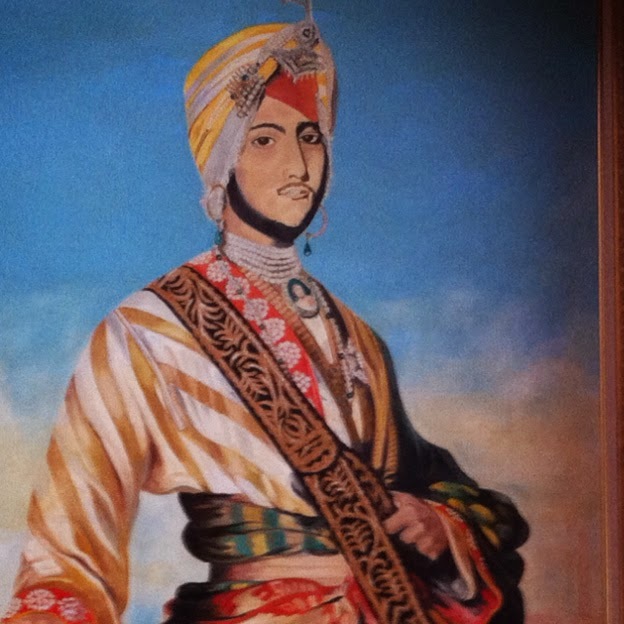 Copy of the portrait of Duleep Singh by Winterhalter. It is now in the Royal Collection at Osborne House on the Isle of Wight. Queen Victoria had this portrait of the young maharajah painted by Winterhalter. It is now in the Royal Collection at Osborne House on the Isle of Wight So for a decade, the maharajah simply enjoyed the fruits of his position - he had a very lavish lifestyle, hunting and shooting with the royal family and travelling all across Europe. In private he had become the quintessential English aristocrat; in public he still presented himself as an Indian prince.However, after 13 years of separation from his mother, he was reunited with her. Now a frail old lady, she was no longer regarded as a threat to the British Empire. She joined the maharajah in England and started to remind her son of his lost kingdom and his Sikh identity. Two years later when she died, Duleep Singh married Bamba Muller, who had been born in Cairo with strong Christian values.After Punjab was annexed, many Sikh soldiers ended up fighting for the British Empire. The couple went on to have six children and moved to Elveden Hall, tucked away in the Suffolk countryside. But by the 1870s, the maharajah was financially in trouble - bringing up six children and supporting his lavish lifestyle on the pension he received from the British government meant he was heavily in debt. He began to question the government about his land and property back in India, claiming the annexation of Punjab had been done in an underhand way. He wrote endless letters to the government, seeking compensation for his lost land in India, but without any success. On 31 March 1886, Duleep Singh took his boldest step - he set sail for India along with his family and told the British he would revert to the Sikh faith and reclaim part of his land. The British could not risk a possible mutiny. When the ship docked in Aden, en route to India, the maharajah was detained and placed under house arrest. His family returned to Britain. 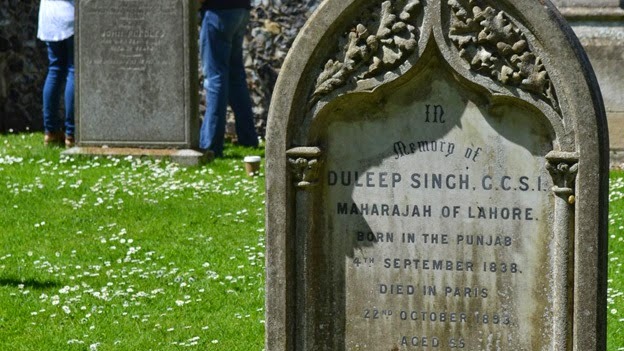 Maharajah Duleep Singh's grave is in the English countryside. Duleep Singh did indeed convert to the Sikh faith but after several frustrated years of wandering, all the while being spied on by the British secret service, he died alone and a pauper, in Paris in October 1893. Says journalist and author Christy Campbell: "In the space of 24 hours the British foreign secretary was instructed to get the body of Maharajah Duleep Singh embalmed, placed in a coffin and brought back to Britain and back to Elveden. It was given a Christian burial at St Andrew's and St Patrick's Church. For reasons of state, the British government had to make sure he was buried a Christian to claim him forever." Mr Campbell, the author of The Maharajah's Box, says it is appropriate to exhume the maharajah's body as he should never have been buried in England.But the exhumation has divided opinion among the Sikh community. Amandeep Singh Madra says it is something he and his charity, the UK Punjab Heritage Association will not be supporting. As far as they are concerned, the last will written by Duleep Singh makes it clear: "I wish to be buried wherever I die. "They say his remains should be left alone. For others in the Sikh community, the issue is exactly where should the last king of the Sikhs be laid to rest? 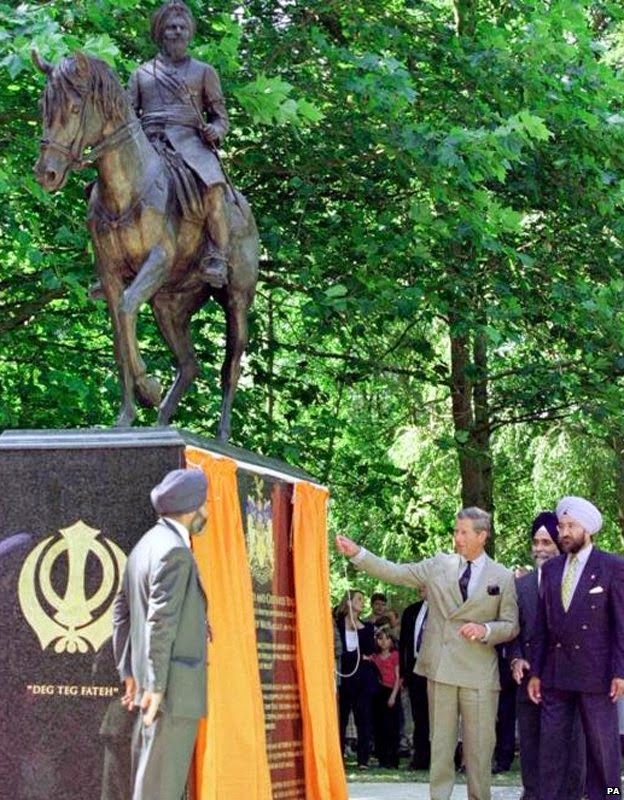 Prince Charles unveiled the statue to Duleep Singh at Elveden in Suffolk in 1999. He was born in Lahore, in what is now Pakistan. There are mutterings of returning him to Amritsar, the Sikh holy city, but nothing has been decided.The Church of England's point of view is expressed by Reverend Paul Tams, from St Andrew's and St Patrick's: "My instinct is he should be left here to rest in peace." As the maharajah was given a Christian burial the campaigners will have to get the Church of England on their side before they can lodge their application with the ministry of justice - the government department that deals with exhumations. "We would never have gone public with this if we didn't think we were going to be successful," says Jasvinder Singh Nagra of the Maharajah Duleep Singh Centenary Trust.But for now, the maharajah remains buried at Elveden.